At 5am every morning, a call to prayer echoes across town from the local mosque. It’s still dark and otherwise quiet outside, but the prayer can be heard from everywhere — a man’s voice oscillating operatic tones in a language I do not understand. It lasts for nearly an hour, it seems, and then all is quiet again until sunrise and I fall back to sleep. I’ve only been here two days so far, but after nearly 30 hours of travel (counting driving, layovers, and getting to Gossas), I was grateful to have an uneventful weekend. Just being immersed in a place and a culture so unlike anything I’ve ever experienced before has been both exhilarating and exhausting — trying to understand what people are saying, piecing together what’s going on, and getting used to what are normal sights, sounds, smells, and tastes here. After getting to Dakar, Senegal well after midnight, my colleagues (the driver and communications assistant/translator) picked me up from my accomodations after noon on Friday and we headed into the belly of the city. I had to exchange my currency and pick up some fruit from the market to take back to Gossas. Dakar was overwhelming. Cars, buses with people clinging to the back, pedestrians, donkeys, and horse-and-carts all jumbled together on the streets in chaos, with no apparent road rules to bring order to the madness. Whenever we came to a standstill in traffic, our vehicle was bombarded by people coming up to the windows trying to sell things — bath towels, toiletry kits, sunglasses, music, toys, peanuts, oranges, books, anything you could think of. My colleagues appeared to ignore this for the most part, but every so often something would catch their interest, and they’d roll down the window and start haggling with the seller, sometimes driving slowly along to keep up with traffic while the seller walked beside the car. If they didn’t like the price, they would hand the item back and roll up the window. If they liked it, they would buy it right there. 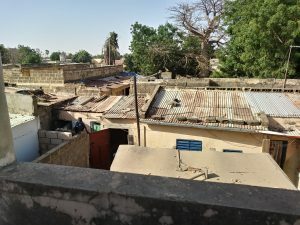 All the communication was in a mix of French and Wolof, so it was difficult to piece together what was going on, but this all seemed quite commonplace to them. At first, we went to a bank to exchange currency, but it turned out it was closed because they had gone on afternoon break. The guard sitting in a plastic chair and listening to his headphones seemed to tell us of another place to go exchange, so we drove for nearly 40 minutes deeper into the chaotic streets of Dakar. Finally our driver, Pape Ba, pulled over and Fatou, the communications assistant, told me to get out. We met what seemed like a random man in robes on the crowded street corner, and he led us into a tiny shop. This was apparently where we were exchanging currency. 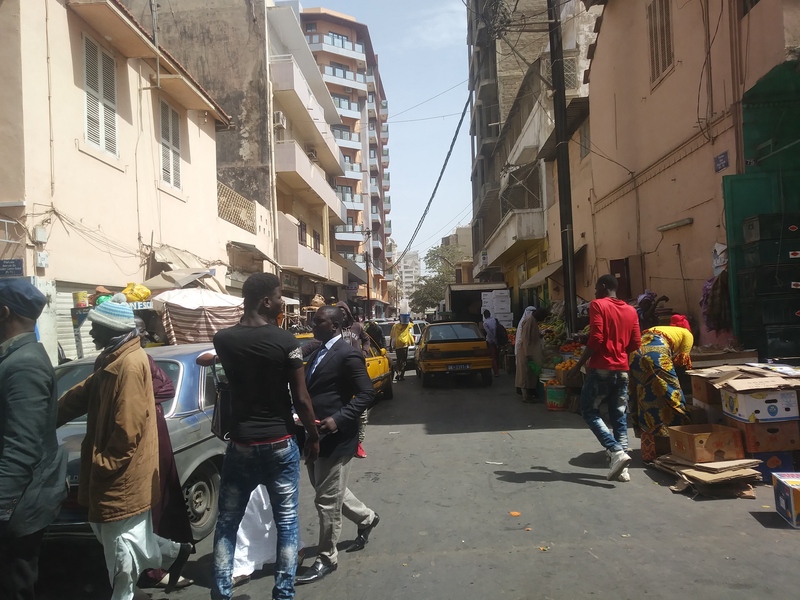 They insisted I sit down, and then Fatou talked with him about the exchange rate, called her boss to confirm it was a good rate, and then the transaction was made. I stuffed the bills away, and we hurried back to the car, where we drove a few blocks further and then got out again to purchase fruit. The process seemed rushed, and it took me a moment to figure out how to do it. “You buy by the kilo,” Fatou told me. “Yeah, that looks good,” I said. Suddenly this didn’t seem so tricky after all. The seller and Fatou spoke again. “One kilo is 1,000 CFA” (West African Francs) said Fatou — roughly $1.87. I added a half kilo of apples, a half kilo of grapefruit, and a kilo of bananas to the order, which came to 3,000 CFA ($5.61) — a ton of fruit for the price! We found Pape Ba parked nearby and got back in. 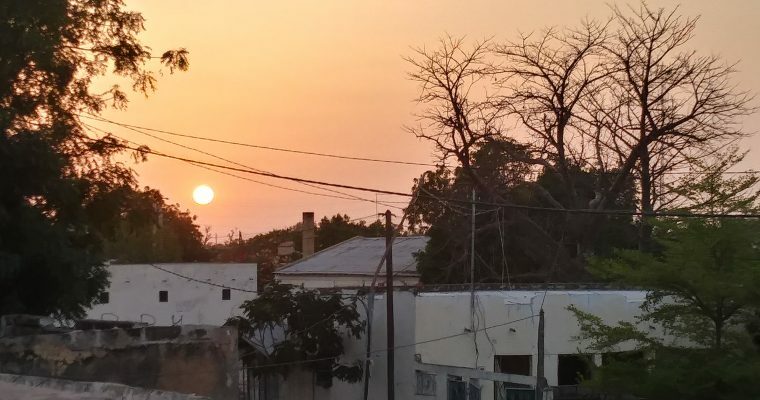 “Now to Gossas!” Fatou said, and we began the slow process of getting out of Dakar. We drove along the coast part of the way, and slowly as we exited the city, the roads opened up. Everything was brown and dry and dusty. People herded cattle through the city; goats and donkeys wandered about through populated areas. All the way to Gossas, the road was lined with small settlements and villages. Children herded goats in the fields. Markets blossomed with colorful fruit stalls. Cars honked and passed one another, some loaded with people hanging off the sides. 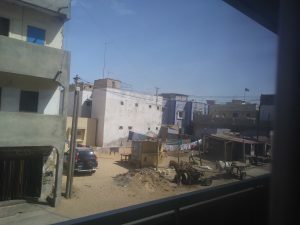 Only men drive in Senegal for the most part, so bus driving makes up a large part of the workforce. Some of the buses had goats riding on top, either strapped down or just standing there. In our own vehicle, we listened to Senegalese music the entire way, and I would soon find that this music seems to be played all the time everywhere. It’s such happy music, with joyful vocals, upbeat instrumentals, and great percussion. We listened to this music for hours, and I never got tired of it. 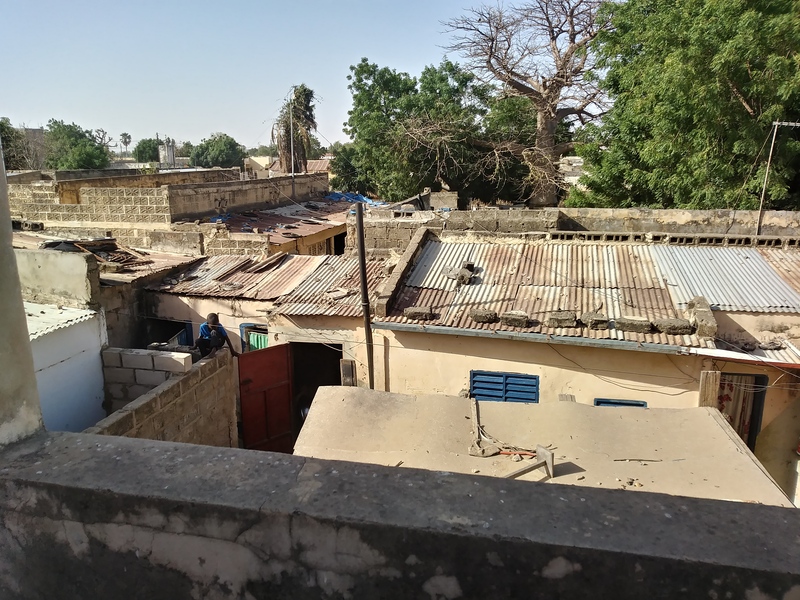 Sadly though, for all the beauty of Senegal’s people and music and culture, the country lacks any form of sanitation system, and so all the way out into the countryside, the fields and roadsides were littered with trash. There is nothing to do with it, except burn it, which people do in their towns, but in between towns, its just left there. Pieces of plastic float like butterflies on the wind, and donkeys and goats forage through cardboard and waste that is speckled across the barren landscape. We finally arrived in Gossas around 5pm, and I got moved into my accomodations for the next couple weeks. 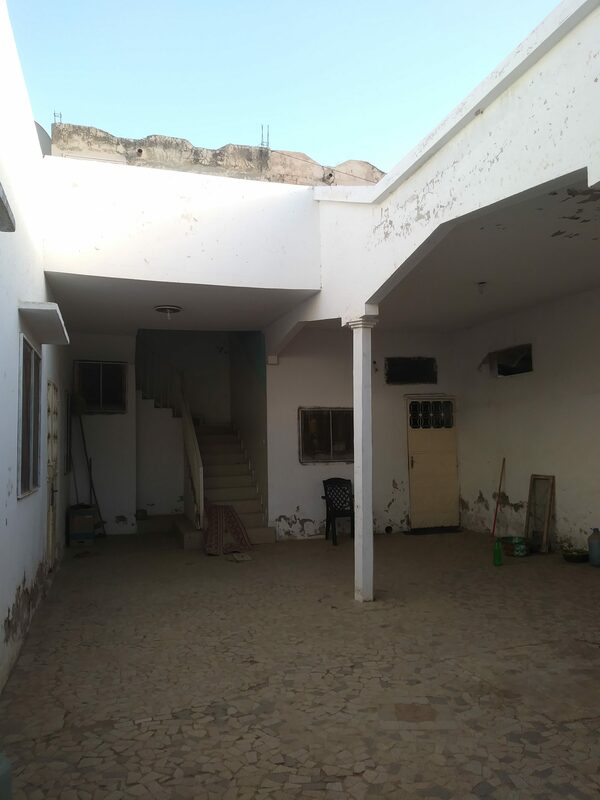 My organization rents a house in the town, which is in the typical form of a small compound — an enclosed courtyard with living quarters on one side, the kitchen across the way, and stairs up to the roof where I found myself enjoying the views of the streets below. There is a housekeeper named Mariame who cooks and cleans during the week (this will take me some getting used to…! ), and she served me a dish of ceebu jen when I arrived. Ceebu jen in a traditional Senegalese fish and rice dish, cooked in a broth with African eggplant, cabbage, carrots, and some sort of root vegetable. After a long couple days of travel, it was delicious. On Saturday when I awoke (again, after the call to prayer), the streets were filled with the clop-clop-clopping of horses hooves and people shouting and bells jingling. It was market day. All day long from the roof, I could see people streaming in from every direction riding on horse-drawn carts, motorcycles, buses, and a few cars. Some of the horses and donkeys wore jingling bells, and some of the carts were loaded with as many as 12 people! Later in the afternoon, they were streaming back out of the town, their carts loaded with bags of onions, grain, fruit, and goats were tied down in the back. Women carried huge buckets and plastic basins on their heads with ease, and children ran around the streets all day, along with the goats and chickens. Few people noticed me from the roof, but the ones who did smiled and waved. I think I’m one of only two non-Senegalese people in this entire town (the other being my supervisor). The housing compound courtyard, kitchen on the right, home on the left, and stairs to the roof above. In the evening, a huge party started a couple blocks away, and they blasted loud African music and beat on buckets and drums until nearly midnight. I watched women walk to the party in their ornate dresses and head wraps, and children danced energetically on the dirt road, squealing and yelling and sometimes wrestling with one another. This morning dawned much quieter after the call to prayer, and I enjoyed a peaceful day getting my equipment ready for the week, working on some art, reading, writing, catching up on email, and taking a nap. I’ll try to provide more description later on a few other details of life here, but this post is getting very long, so I’ll leave it here for now. More photos will also probably have to wait until I get back to the states, since it takes about a half millenium to upload anything. Tomorrow the work begins. I hope I’m ready! Hi Andea! I enjoyed reading your post so much. For someone like myself who longs to travel, but will probably never get to do much of it, it was so interesting to read about what you see and your take on it. I love the pictures and look forward to reading the rest of the posts about your visit as well as seeing the pictures when you return home. Be safe and enjoy soaking up the culture.